The main difference between her and Batman isn't in the utility belt. Before being shot in the spine by the Joker, Barbara Gordon had an active career as Batgirl. She has since found a new way to fight crime, but still misses the freedom afforded her by being Batgirl. 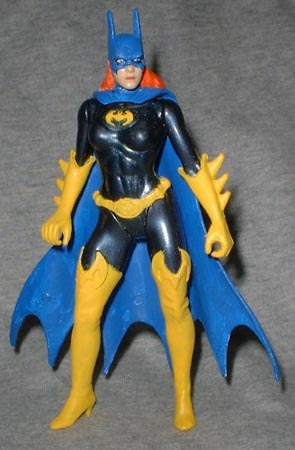 In a real stretch of the imagination, Batgirl was made from a Batman and Robin Batgirl figure. All I really had to do was sculpt the hair sticking out the back of her mask - the rest of the details were already there, just waiting to be painted over. Batgirl is 5" tall and moves at the hips and shoulders - the hair keeps the head from moving. Did you like Babs better before or after she became Oracle? Tell us on our message board, the Loafing Lounge.